Laura Mijangos was born and raised in San Antonio, Texas. She studied stone sculpture at Trinity University under Philip Evett and graduated in 1979. Laura also studied painting under her father, Alberto Mijangos. 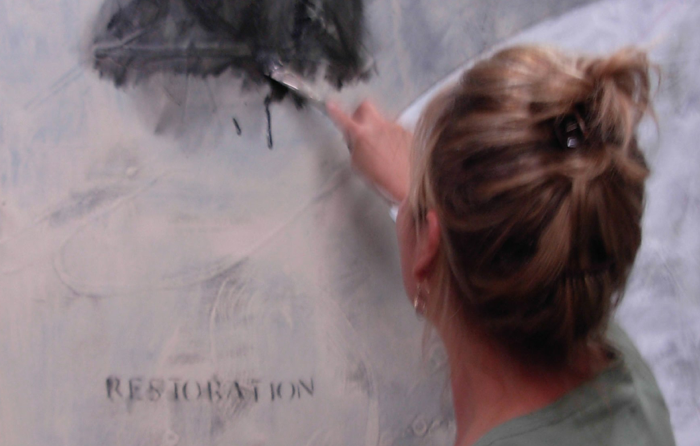 When I began to paint I had no lofty goals or preconceived ideas. I just knew I had to paint. Now as I look back on my work I begin to see a pattern. In each piece, my subliminal goal is to express something that cannot be expressed in words. “It is the third language”, as my father used to say. It is what is deep within me, created by experiences. Some that I cannot remember but they are there just the same. Some that are too painful to remember, but have made me who I am. And some that are too beautiful to forget. So with each piece I begin by laying color, and texture, and emotion, and more color, more texture, more emotion, until I see a moment in my life unfold on the canvas. And my hope is that my story will speak to someone else's story.